Stacy when the bracelet tutorial is followed correctly can you tell me how the bracelet lays on your wrist? Is there suppose to be a gap between the two coil ends or are the coils suppose to fit flush with each other? Is the wire band worn on the top of the wrist? 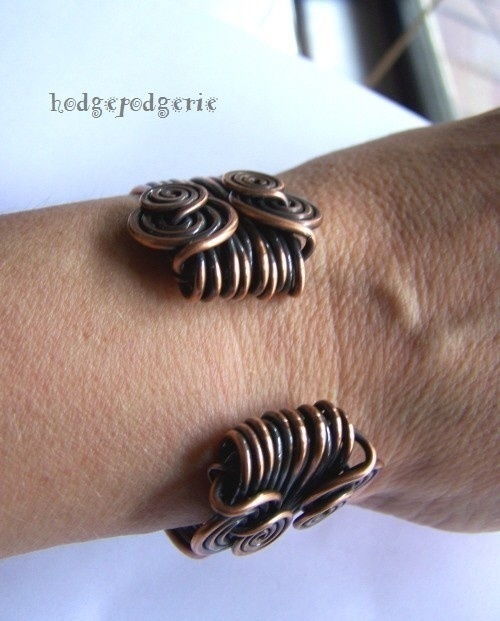 Here's a picture of how I like to wear my Aegean Cuff, with the design at the top of my wrist. You can see the gap between the cuff ends. I just squeeze it lightly so that it doesn't move. If you've purchased the tutorial and have any questions about it, you may email me directly using the email address on the tutorial.